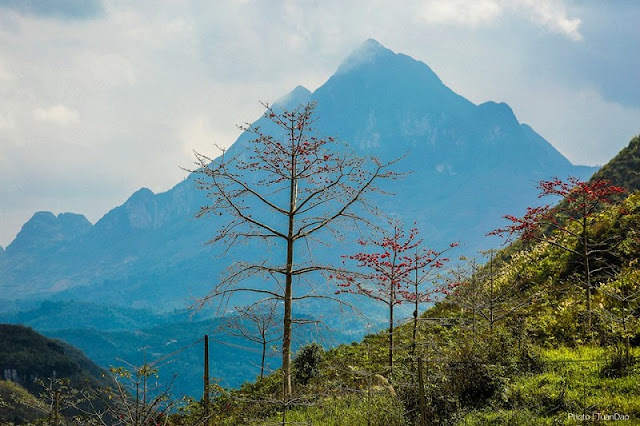 With the adventurers who love Ha Giang because of the beauty of the adventure for conquest and discovery, Ha Giang is also beautiful in any season. Tourists often prefer to go to Ha Giang in the flower seasons, January with peaches, plums, white mustard, and yellow mustard; November with triangular circuit. People take photos often choose Hoang Su Phi route with the dazzling beauty of the water season pouring in late May and the picturesque golden season in September and October. But few people suspect that March Ha Giang has a special beauty, which can be called the beauty of the land season is rested and planting. On the way you will meet a lot of cherry blossoms at the end of the season, though not as brilliant as the beginning of the season, but enough to disturb every step. Red rice flowers along the stream, along the slopes, river banks, and on the rocks. Ethnic minorities harvest turnips, each a turnip equal to the calves of young children, sliced and dried in front of the porch. Through Lao Xa, Sung La, people everywhere are plowing on the rocks and the mountains to sow corn, husbands go ahead to cultivate the land, check the seeds, the wife goes after sprinkling fertilizer, applying ash, the scene is extremely simple but dear. Hoang Su Phi, where many villages of ethnic groups live, thinks only beautiful in the pouring season and the season of ripe rice but the land season is rested brings an unexpected beauty, beauty of colors and shapes. Phung village, the place most famous for its poetic and peaceful beauty, attracts many tourists every year.